Take a look at the Mediterranean Diet pyramid and you’ll find beans and legumes (that’s just another name for beans) in a conspicuous place among foods to be eaten daily. 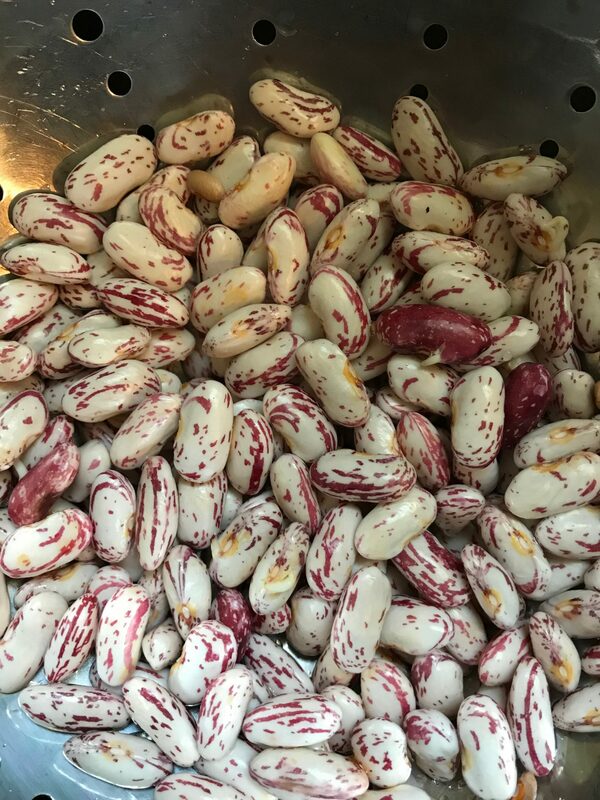 That doesn’t mean a heaping plate of beans once a day—far from it, but rather that beans are among many vegetables that should play a prominent role in a healthy diet. 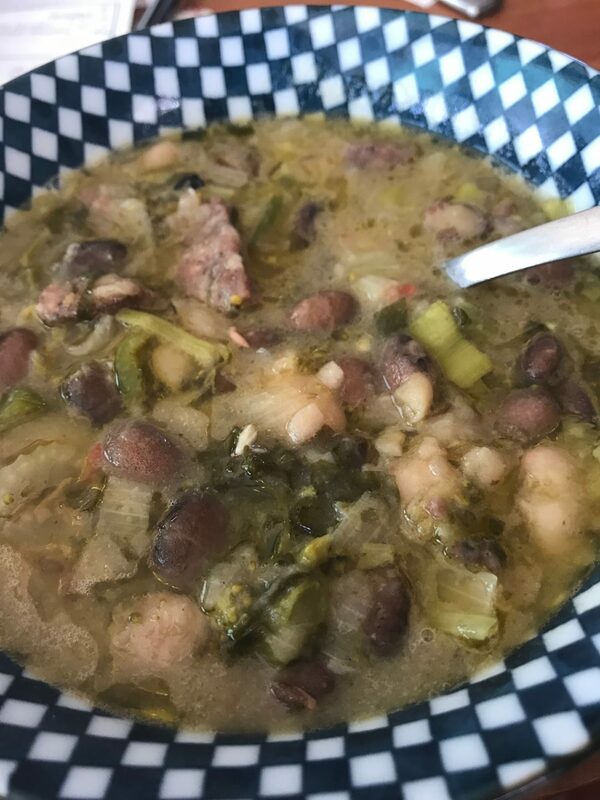 Beans are truly nutritional powerhouses, high in fiber and so low in calories and fat that you can feel comfortable adding a good glug of extra-virgin to your plate of beans. At the same time they’re an excellent source of protein, so much so that they’re a must on any vegetarian or vegan table. And legumes are cheap. Anyone who complains that the Mediterranean diet is expensive hasn’t looked at the price of beans lately. Right now I’m seeing dried beans on Amazon with prices as low as 18 cents an ounce (less than $3 a pound). That has to be the cheapest protein on the market by far. Keep in mind when buying beans that the older they are the longer they will take to cook. 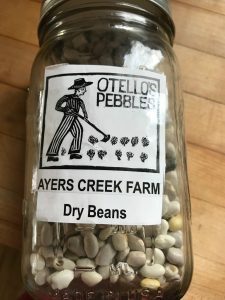 If I can’t buy direct from the farmer, by far the preferred method, I go to a health food store or food coop where the turnover tends to be very high and the beans are more likely than not to be this season’s harvest rather than a couple of years old. 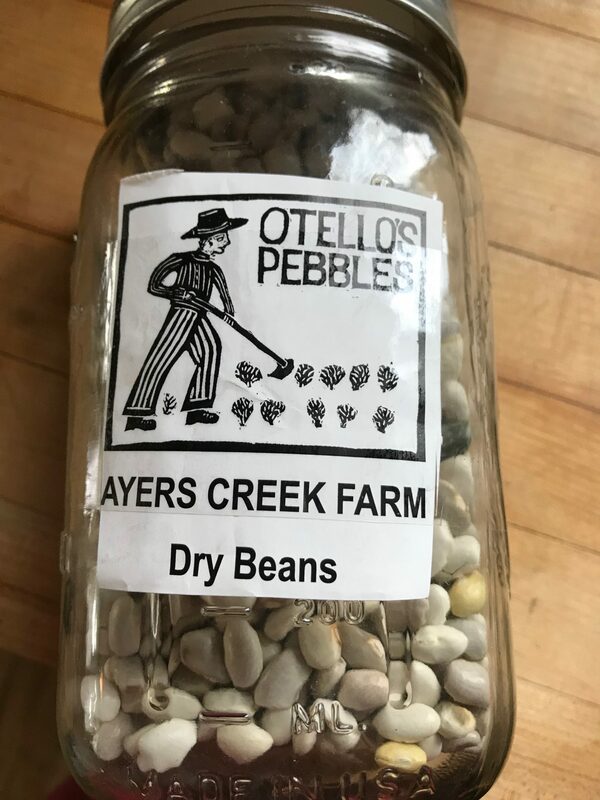 The beans I used most recently are called Otello’s pebbles, grown at Ayers Creek Farm in Gaston, Oregon, but there are a multitude of varieties available (Jacob’s cattle, Anasazi, pinto and cranberry, aka borlotti, just to name a few) and all work well with these recipes, although cooking times may vary with the size of the beans—big kidney beans take longer than little pea beans for instance. 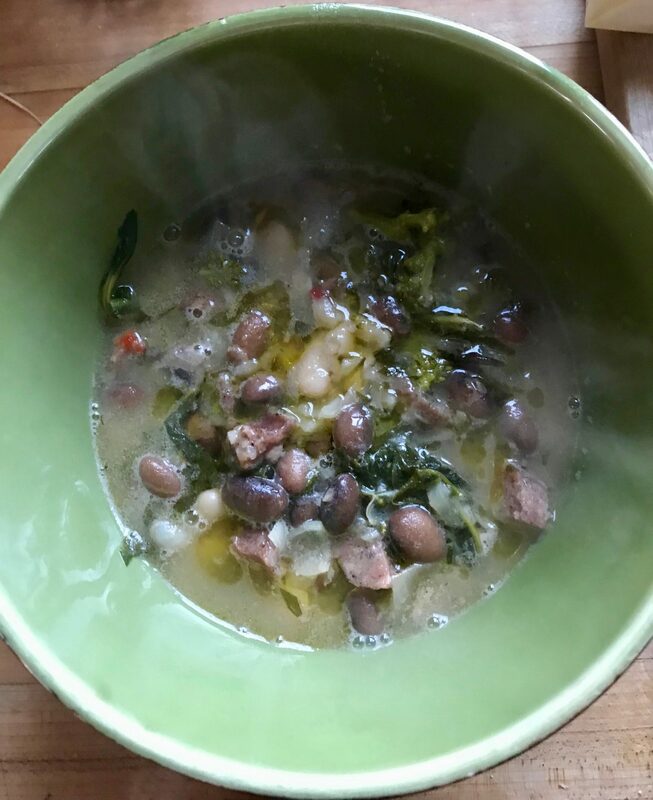 A cup of dried beans soaked overnight should give you 2 to 2 ½ cups of soaked beans, which will cook up all on their own to a generous six servings with some left over for – well, for leftovers. 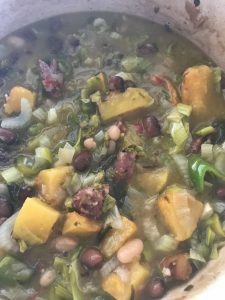 But since I don’t always have time for an overnight soak, I like to double the quantity and freeze half of the soaked, uncooked beans for use later. Soak 1 or 2 cups of beans in water to cover to a depth of 2 inches overnight. Drain the beans and, if you’ve soaked 2 cups, put half aside to freeze. Add the remaining soaked and drained beans to a good-sized saucepan and tip in boiling water to cover to a depth of 1 inch. Set over medium-low heat and the minute the liquid starts to simmer, reduce to as low as you can to keep the liquid just simmering. Add aromatic vegetables: a small onion peeled and halved, a couple of cloves of peeled garlic, a carrot scraped and split in half, a dried red chili pepper if you wish, and a 1-inch stem of ginger split in half. A couple of bayleaves if you have them will add a nice touch. Cover the pot and let the beans simmer until they are soft—30 minutes to 1 ½ hours, depending on the age of the beans. 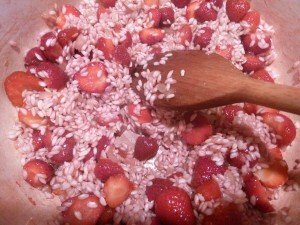 Add boiling water from time to time as needed. When the beans are done, remove them from the heat and drain reserving the cooking liquid. Discard the aromatics or, if you prefer, chop the onion, garlic and carrot coarsely and add back to the beans. 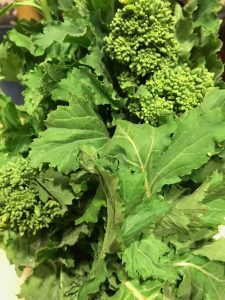 Add color with small chunks of acorn or butternut squash, browned in olive oil before adding, or tuck a few little grape tomatoes into the simmering soup and cook just until they pop. Or just use your imagination and wing it. 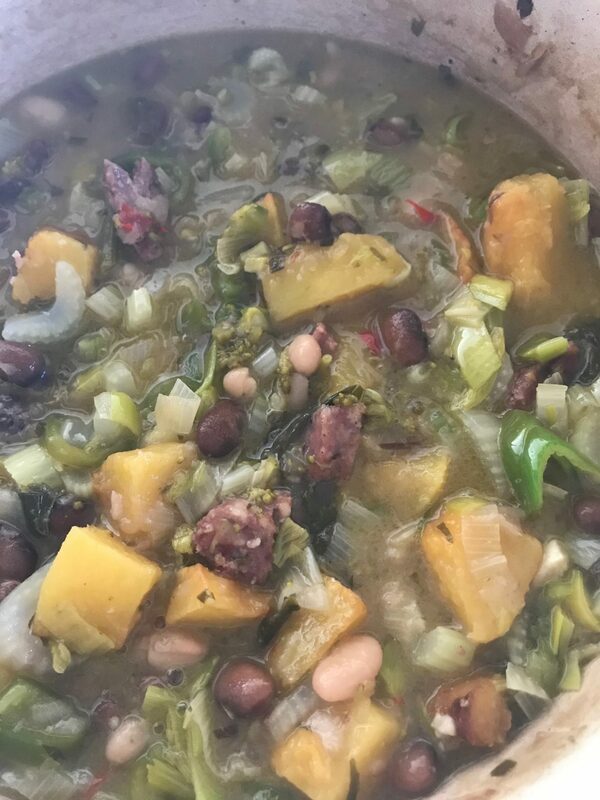 The beans will provide a healthy platform for just about any starch–rice or pasta cooked separately and stirred in, cubes of tender potato, or just a slice of good crusty country-style bread, toasted and dolloped with extra-virgin before topping with beans. 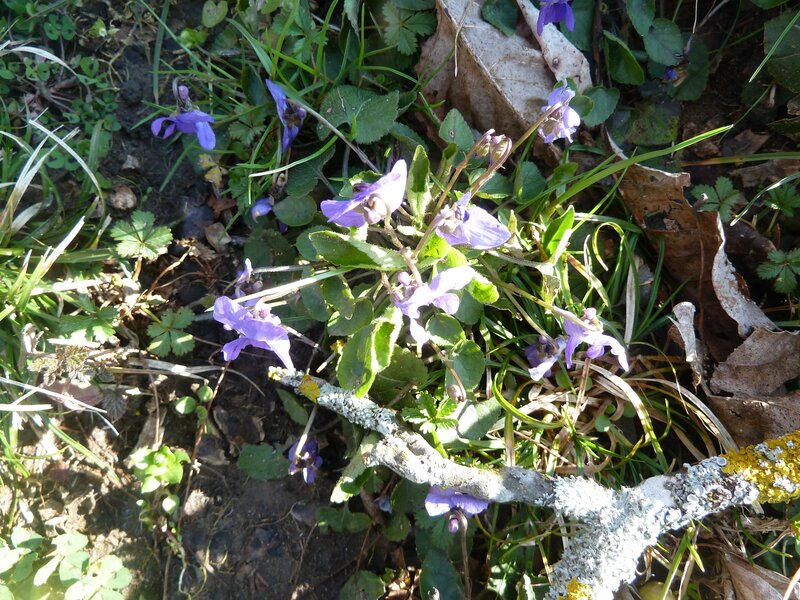 Silver Lining on a Tuscan cloud?